With their concise size, sleek look and ease of use, ukuleles are certainly on the rise. You might spot a person with a ukulele more frequently on your hangouts than you ever did before. 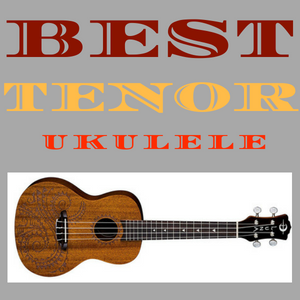 In case, you want to start the journey as well, a Best Baritone ukulele would be a thoughtful choice to start with. Because if you already know how to play the guitar, mastering the baritone should be a piece of cake for you. It comes with the strings D G B E just like a guitar just minus the last two strings. 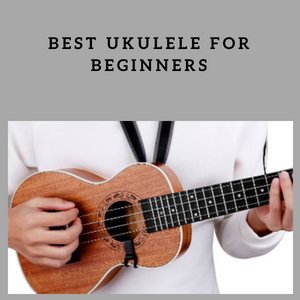 But, if you do not already play the guitar, learning the Best Baritone Ukulele will be slightly easier for its spacious build. However, you may be a quick learner or a great player, but the wrong ukulele will dismantle you. 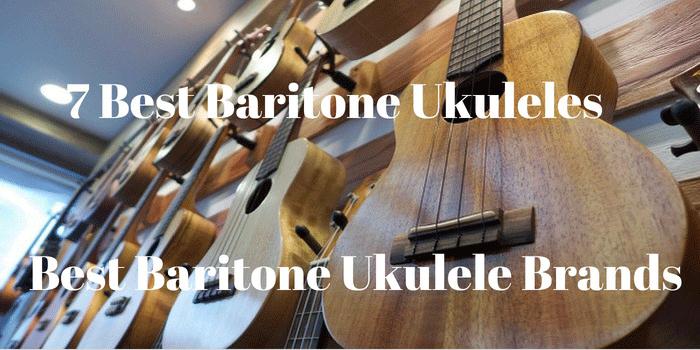 In order to help you find the best brand ukulele of baritone for yourself, we have reviewed seven best baritone ukulele and included a buying guide. Therefore, let’s get your journey started. You better know the difference of the Baritone Ukulele with other ukuleles before going down this road. 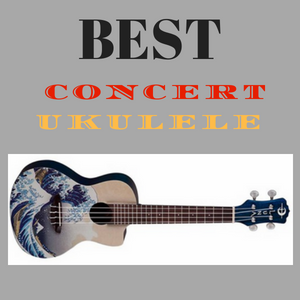 Well, Baritone ukulele size is basically the largest among the concert, soprano and tenor ukuleles. With a different tuning, it neither sounds like a guitar nor a ukulele but deeper and warmer. However, due to the difference of baritone uke tuning, you might find learning from traditional chord sheets and videos a bit difficult. 1. Your level of experience: If you know how to play other ukuleles, you will find that this ukulele is a bit difficult to play with its unique tuning. But, you can change the setup if it’s too troublesome. Apart from that, if you are past the beginner level, you should look for features and quality that suits your level. 2. The purpose of its use: If you are buying it for stage performance or more, you should definitely look for advanced models like acoustic/electric ukuleles. However, you can go for an ordinary, sturdy ukulele for teaching and minor entertaining purposes. 3. The building and its material: In case of ukuleles, the build material has a good rule over its sound. Out of the variety of woods used in ukuleles, Koa and Mahogany are the most common. Koa ukuleles usually have a very warm sound while Mahogany ones have a bit softer sounds than Koa ones. You will find two kinds of build-Laminated and Solid. Laminated ukuleles usually have a great quality wood layer outside and cheaper wood layer inside. Where solid ones are made of the same good-quality wood throughout. 4. Price: You get what you pay for. Basically, you should start from $100 for a beginners quality and higher for better features. 1. MAIN-17434 Kala MK-B Baritone Ukulele. 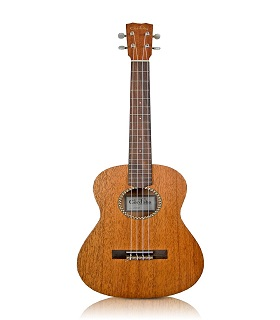 If you just want to try learning ukulele and not even sure if you would want to continue later, this cheap, but great Kala Baritone Ukulele should keep you attached to it. Not only does it lessen your risks of spending too much for no reason, but it makes the expense worth it. You will be amazed by its look and sound once you get your hands on it. Kala used agathis to construct the body of this ukulele and mahogany for the neck. The combination provides not only a warm sound but also higher volume. Also, the satin finish adds to its quality. Moreover, the rosewood fretboard and bridge gives the Kala baritone ukulele a great look and a smooth touch. Moreover, the geared tuner also adds to the quality by keeping the string tension consistent. Intelligent build with agathis and mahogany. 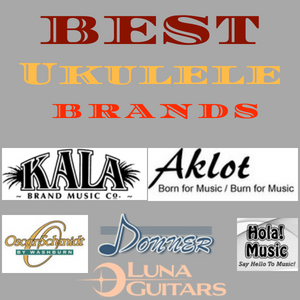 The best Kala Baritone ukulele quality. 2. 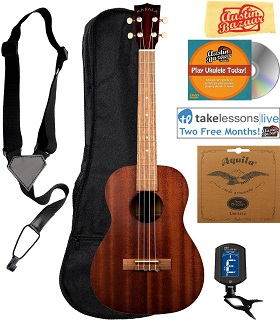 Kala KAA-15B Satin Mahogany Baritone Ukulele Bundle. This is basically the last Baritone ukulele we mentioned with a few changes. The first that matters is that it comes in a bundle. You get everything you need at a much lower price than what you would have paid separately for each. Moreover, you have the option to choose between a gig bag and a hard case. 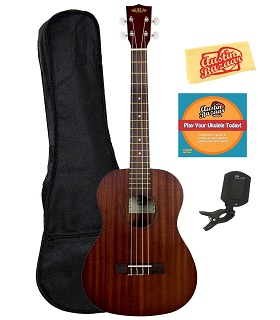 Apparently, it comes with some essential ukulele accessories such as the bag, tuner, a DVD and a polish cloth. As for the construction, it offers you the best solid quality with a mahogany body and neck. It features a walnut fingerboard. With a dimension of 31 x 4 x 12 inches, it also comes with a geared chrome die-cast tuners to make the strings consistent and Aquila Nylgut strings to provide the best sounds. 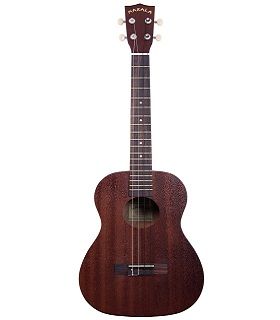 Lastly, with a satin finish, it looks great and is the best sounding baritone ukulele. Great quality builds with mahogany. 3. Sawtooth Mahogany Baritone Ukulele ST-UKE-MB. If you are just beginning and want a ukulele that you can use not just now, but in the future at any level, this is a great ukulele of Sawtooth. It is built of mahogany at its top, back and neck which helps to produce a warm, deep, mid-range tone. You will feel great owning it because it does not just provide the best quality, but also looks great with its laser edged rosette design. It features a rosewood bridge and fingerboard. The fingerboard consists of dot inlay with 20-inch scale lengths. Apart from that, the Aquila nylgut strings assure the sound quality further and the geared tuner assures consistent string tuning. The ukulele does not come alone, but with a Quick Start Guide, Gig bag, stand and tuner. Very low price for such good quality features and accessories. 4. Kala MK-B Makala Baritone Ukulele Bundle. With so many Kala ukuleles on our list, you should already know how great the quality of these ukuleles is. It’s not just us drooling over their ukuleles, but everyone else. 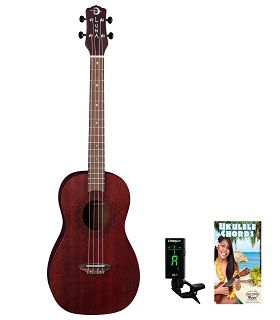 This bundle is apparently great baritone ukulele for beginners. Kala used both Mahogany and agathis in its construction, mahogany on the neck, back and top with agathis on the body. This particular construction with a satin finish gives the ukulele a traditional look that anyone would find tasteful. The Rosewood Bridge and fingerboard also adds to the looks and quality. Moreover, it arrives with the Aquila Nylgut strings pre-installed. In order to keep you safe from all the tuning trouble, it has a geared tuner for tuning and keeping it tuned. Apart from that, the bundle offers a digital clip-on tuner which is great for the price. It also comes with a gig bag, DVD and polishing cloth. A digital clip-on tuner included. Well-built with the combination of mahogany and agathis. 5. Luna Vintage Mahogany Baritone Ukulele with Quick Start Guide and Tuner. As the name suggests, this Luna Vintage Mahogany ukulele has an appealing vintage look that makes it suitable for any occasion. Moreover, it has a complete mahogany top, body and neck build except the fingerboard and bridge, which helps it produce a warm, mid-range sound. The rosewood fingerboard has 19 different frets each of 1-inch length and 1.5-inch nuts. The MOP Shark teeth inlays on the fingerboard to mark it also makes it look better besides making it easier to use. Moreover, it’s not just easy to use but also easy to keep in tune because of its closed geared-tuners. Talk about convenience! The unique red satin finish makes it look from an era of kings and queens and will probably make you feel like a royal as well. 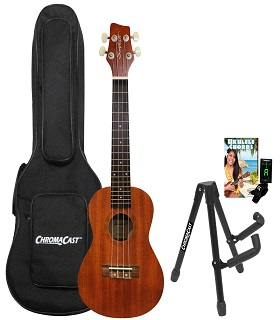 Lastly, it is a generous bundle that comes with a Chroma Cast Chromatic tuner and a starter guide. The tuner can get a bit difficult to work with. 6. Caramel CB500 30 Inch All Rosewood Baritone Acoustic-Electric Ukulele with Truss Rod. Need the ukulele to perform in concert halls and not sound like an insect? This Baritone Electric Ukulele with its dual nature will make you famous in no time. While all the models we reviewed before were acoustic ones, this one is an acoustic Baritone Electric Ukulele. This particularly means that it comes with an electric pickup which you can connect to an amplifier for louder sound. So, you won’t sound like an insect in a large hall with the right amplification. As for the build, it has complete rosewood build with buffalo bone saddle and bone nut. The neck has a truss rod in it and 18 frets, making it easy for you to adjust. As for the extras, it comes with a 3-band Equalizer to get the sound of your choice. Great look with rosewood construction. Appealing sound, whether plugged or unplugged. Comes with an onboard tuner. Truss rod in the neck. One of the best quality baritone electric ukulele. Batteries may not be included. Does not feature any other accessories. 7. Cordoba 20BM Baritone Ukulele. Want to show off your ukulele to your friends and when they ask where they can find the same, impress them saying its limited edition? 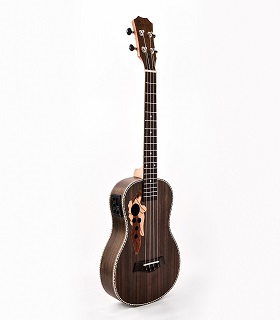 Then say hello to the Cordoba 20BM Baritone Ukulele. The 20BM is Cordoba’s first baritone sized ukulele. Its mahogany top and mahogany back and side give it the solid build and look great ukuleles have. The rosewood bridge and fingerboard adds to its beauty and quality. Moreover, to aid your tuning, it features geared tuners alongside providing the best quality Aquila Nylgut strings for the best sound. Besides making you feel exclusive it will also make you feel like a person of great taste with its attractive stain finish and rosette design. It, apparently, has a dimension of 29 x 9 x 17 inches. This is the best baritone ukulele under $200. Music is not just for the skills, but the soul. Therefore, when you buy a musical instrument, there is much more to consider than just the mechanics. You should not just look for ukulele that provides great sound, but one that provides a sound that fits your choice. Moreover, the outlook is an important thing to consider as it adds to your personality. 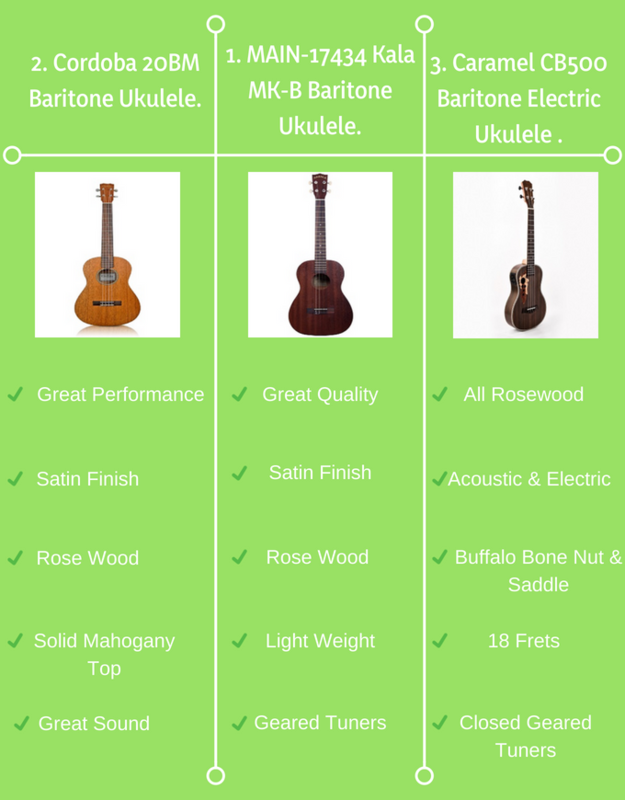 Our reviews and guide should help you find the best baritone ukulele for your nature promising innumerable memorable moments ahead.